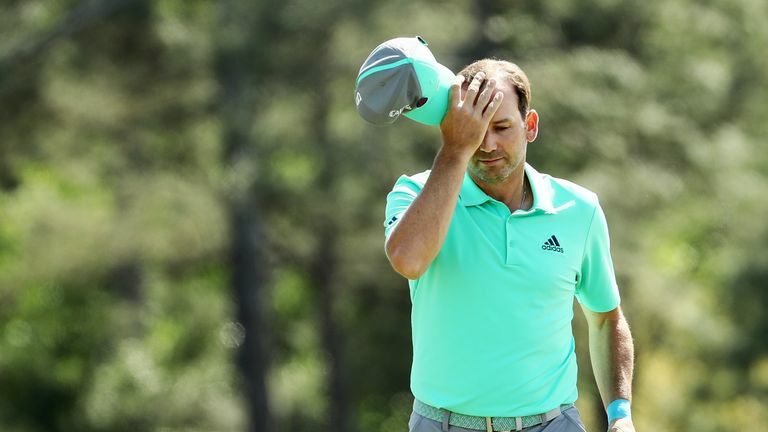 Sergio Garcia appears likely to escape a suspension despite his disqualification from the Saudi International for damaging greens during the third round. Garcia became the first player to be disqualified for "serious misconduct" during a tournament since the inception of the European Tour in 1972, and the Spaniard issued an apology to the Tour and his fellow professionals for "damaging a couple of greens". The 2017 Masters champion is understood to have caused scuff marks and a divot hole to the putting surfaces at the Royal Greens Golf and Country Club as his frustration boiled over on day three, and his petulant behaviour prompted complaints from the players in the groups behind him. His fragile temper was also on display in Friday's second round, when he angrily slammed his wedge into a bunker after needing two attempts to escape the trap, blaming his poor lie on the sand not being raked properly. Garcia was expected to face sanctions from the European Tour's disciplinary committee, but a report in The Scotsman suggests that the Tour's chief executive, Keith Pelley, considers the matter closed following Garcia's apology to his peers. "The incident is over," Pelley is quoted as saying. "We have dealt with it. Sergio has apologised to the players and we move on." English veteran Robert Rock was one of the players who received a personal apology from Garcia, who was also defended by third-day playing-partner Renato Paratore as both spoke to The Scotsman journalist, Martin Dempster, before beginning their final rounds. Rock said: "It was scuff marks and also a mark that appeared to have been made by what looked to have been a putter. Scuff marks really show up on these grainy greens. Even if you drag the sole of your shoe without meaning to, it pulls up the grass. "The greens are good with no bald patches and scuff marks certainly show up. Like everyone else, I did not know who it was. I wasn't sure if it was one person or more people. I have spoken to Sergio about it. He faced up to it and we are fine. Everyone makes a mistake at some point." Paratore added: "I was not complaining. It was a bad day for him and I saw only one hole when he was doing something wrong. I don't remember what it was. I was focused on what I was doing. But it is okay. "I know him really well and he's a very good guy off the course. It can happen to everyone." Tournament director David Williams confirmed he had discussed the incidents with Garcia over the second half of his round on Saturday, although he did not witness any inappropriate conduct while following their group. "I went out after the referees had spoken to me," said Williams "I got to Garcia around the 12th and 13th and there had been no more damage after nine holes. I told him this was a disqualifiable offence. He was in his game zone, but he listened. We exchanged a few pleasantries and then he nodded and carried on walking. "It was obviously not a good situation to be in. He was obviously very frustrated and it is something very unusual to happen. Some of the marks were similar to what we sometimes see out in South Africa when a buck has run across a green. Over here it could have been a camel. "The players in the groups immediately behind didn't know what was going on. They wanted to know what was happening to the greens. To be honest, they were pretty shocked. As news started to spread, Keith Pelley got involved and, after holding a meeting with senior referee, Andy McFee, he spoke to Sergio after the round. There were no other players involved."